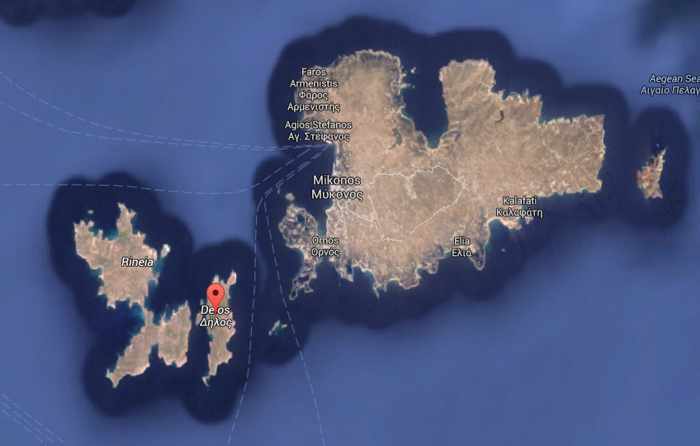 A tiny isle of less than 7 square kilometers, Delos is wedged between Rhineia island (left) and Mykonos (right). There are several ways to reach Delos. Since Mykonos is the closest nearby island, it’s the primary departure point for most Delos visitors. Transport options from April to late October include daily ferry service from Mykonos Town, organized tour excursions, and private boat charters. During winter months, ferry service operates on a very limited schedule, while tours and charters are generally unavailable. 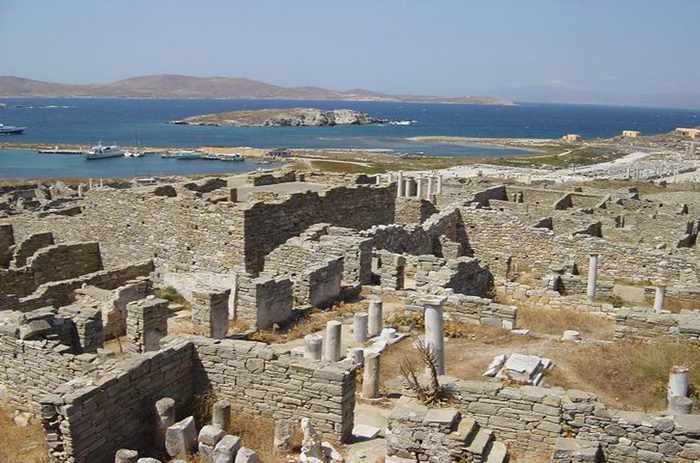 Delos can be reached on tour boat daytrips from several other islands in the Cyclades. 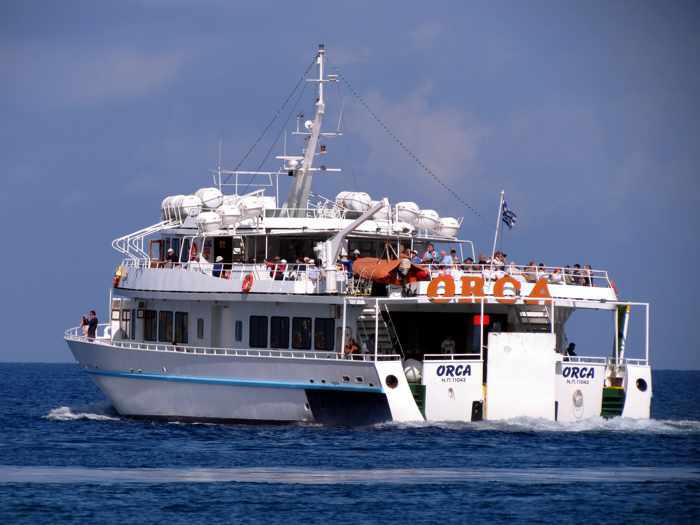 Organized excursions are available several days per week from Naxos and Paros, and apparently in summer months there are excursions from Tinos, too (however, I could not find any schedules or other information online to confirm if trips from Tinos are being offered this year). Private boat charters usually can be arranged from islands within reasonable daytrip sailing distance of Delos. If you’re visiting islands in the Cyclades, check with local travel agencies to see what, if any, tours to Delos are available. Below you’ll find detailed information about the various ways you can get to Delos. The cheapest and most popular way to reach Delos is by ferry from Mykonos Town, which is situated approximately 6 nautical miles from Delos. In fact, this is how the vast majority of visitors travel to and from the island. (I have taken the ferries on two of my own three visits to Delos.) 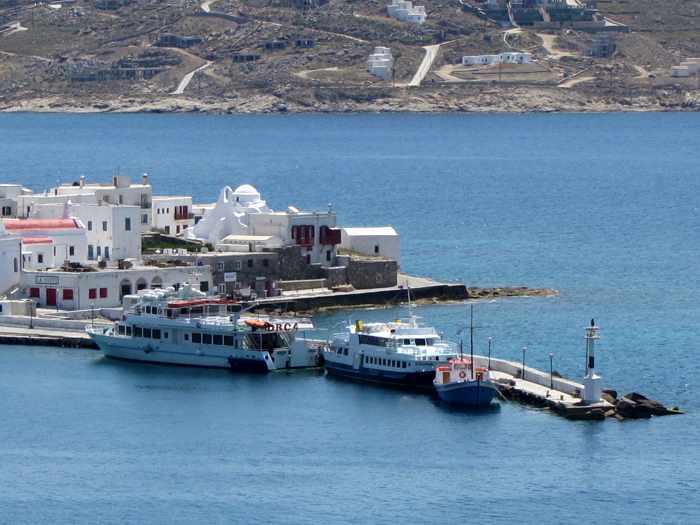 Round-trip ferry rides are available on three ships operated by Delos Tours, a joint venture involving the family firm which has provided transportation between the two islands since the 1930s. Weather permitting, the ferries run year-round, but during winter months (the beginning of November through to the end of March) service is offered only on Fridays and Sundays. According to the Delos Tours ferry itinerary, the Friday ship leaves Mykonos at 8 a.m. and returns from Delos at 12 noon. On Sundays, visitors can enjoy three extra hours on Delos — the ferry departs Mykonos at 8 a.m., and comes back from Delos at 3 p.m.
During the summer tourist season, ferries operate every day of the week. Like most major archaeological sites and public museums in Greece, Delos used to be closed to the public on Mondays. But beginning in 2014, the Greek government extended the daily hours of operation for Delos and more than 30 other sites, and launched Monday openings for the summer period. Since then, Delos has been open 12 hours per day seven days a week, and also has evening ferry service. Although the changes took effect nearly two years ago, I have noticed that many websites and travel guides still state that Delos remains shut on Mondays, and also say that tourists must leave the island by 3 p.m., Many websites, including some for Mykonos tour and travel agencies, also show outdated information about ferry schedules and ticket prices. For official ferry times and prices, always consult the Delos Tours website before travelling to Mykonos. ♦ On Mondays there are only two return ferry trips, one in the morning and one in the evening. The morning ferry departs Mykonos at 10 a.m. and returns from Delos at 1:30 p.m. The evening ferry departs Mykonos at 5 p.m. and leaves Delos at 8 p.m.
♦ Tuesdays through Sundays, ferries leave Mykonos at 9, 10 and 11:30 a.m. They return from Delos at 12 noon, 1:30 and 3 p.m. 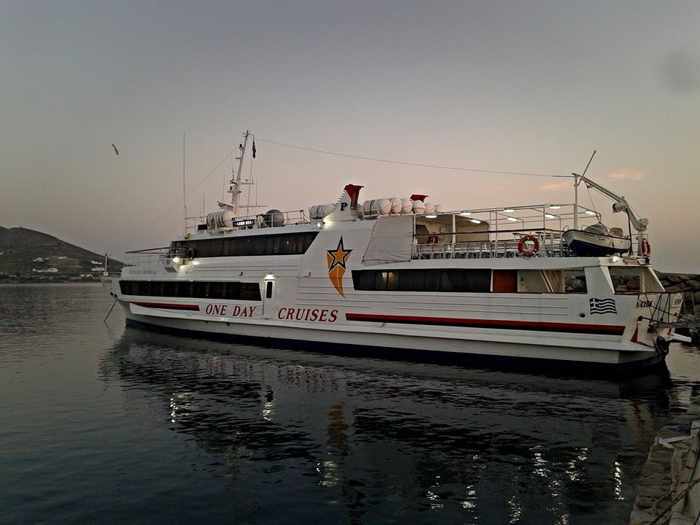 The evening ferry departs Mykonos at 5 p.m. and returns from Delos at 8 p.m. Visitors can return to Mykonos on any of the afternoon ferries or wait for the 8 p.m. sailing if they want to spend the full day on Delos. The ferry rides take approximately 30 minutes each way, but the trip can take either slightly less time or considerably more depending upon weather and sea conditions. Ferry ticket prices have increased slightly for 2016. Round-trip tickets cost €20 for adults and €10 for children aged 6 to 12. Kids under 6 can ride for free. If you’re travelling in a group, contact Delos Tours to inquire about group discounts or special offers that might be available. Note that these prices are for the boat rides only. Ferry tickets can be purchased online directly from Delos Tours (you’ll see a booking form on most pages of the Delos Tours website). Be sure to read the cancellation and refund policy prior to purchasing your tickets online. Fares will be fully refunded if ferries are cancelled due to bad weather, but refund restrictions apply to passengers cancelling for their own reasons. Here’s a tip for those of you who may be prone to seasickness — wait until you get to Mykonos to buy your tickets. On extremely windy days, the seas will be rough and the ferry rides will be extremely unpleasant, so avoid visiting Delos then and delay your excursion to a day on which calmer weather conditions prevail. Note that admission to Delos is not included in the ferry fare. 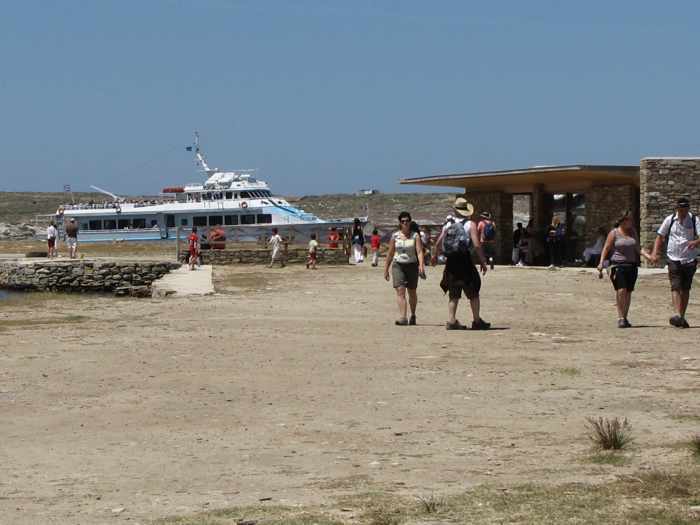 To access the archaeological site from the Delos ferry pier, visitors must pay an admission fee of €12 per person at the entrance gate ticket office. (During winter months, the admission fee is half price.) This fee does not apply to guided tours offered by Delos Tours (it’s included in their price; see details below). Scores of travel agencies and tour companies based in Mykonos and elsewhere in Greece sell organized tours and daytrips to Delos, as you’ll quickly discover if you do a Google search. 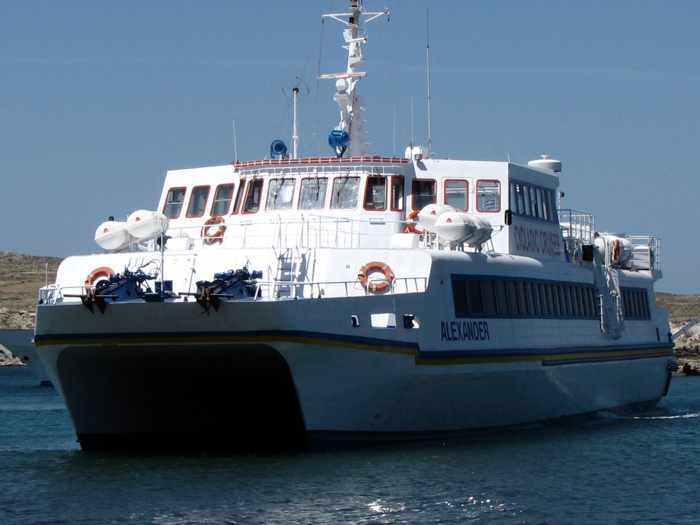 Most of these tours use the Delos ferries to transfer participants to and from the island, though some may offer private charter transportation. If you are staying on Mykonos, drop into any of the island’s travel and ferry ticket agencies to see what daytrips may be available, and compare prices and package features. If you book online, be sure to check cancellation and refund policies prior to making a reservation. Also confirm if the price includes the ferry ticket charges and Delos admission fee. Some firms include these costs in their price, but others require the customer to pay these fees separately. ♦ Mykonos Tours offers a shared 4-hour excursion to Delos, with a professional guide, at prices of €50 for adults and €25 for kids aged 6 to 12. Children under 6 can travel for free. The tour description does not say if entrance fees to Delos are included in the price. Mykonos Tours also has an 8-hour shared cruise that starts with beach time and lunch at Rhinea, followed by a 90-minute visit to Delos. These tours cost €95 for adults and €65 for children aged 3 to 12, but does not include the entrance fee to Delos. Arrangements can be made for guides on these tours, at extra cost. See the Mykonos Tours website for further details about these day cruises, as well as an evening sunset cruise that sails near Delos. ♦ The Mykonos Accommodation Center offers the same guided excursions, at the same prices, that are provided by Delos Tours. See their website’s Delos page for photos and further information. ♦ Key Tours shows seven different Delos tour options on their website including a half-day trip, a cruise to Delos and Rhineia, a cruise to Delos and Paradise beach on Mykonos, and a sunset cruise. ♦ Mykonos Cruises (formerly named Aegean Ventures) offers shared day cruises to Delos and Rhineia, as well as to Delos and Paradise beach on Mykonos. Its Delos & Rhineia Cruise includes a 2-hour stop at Delos, where passengers can either visit the ruins or stay on board to sunbathe and swim. The boat then heads to secluded coves and beaches on Rhineia where guests get to swim and snorkel for several hours. The tours are offered every Tuesday and Thursday during June, July, August and September. The price is €85 for adults and €43 for children aged 2 – 13. The Delos & South Beaches Cruise operates Wednesdays and Saturdays from June through September, and prices are the same as those for the Delos & Rhineia package. This particular tour includes a 2-hour stop at Delos, followed by 3 hours at Paradise beach on Mykonos. Entrance fees to Delos are not included in the price. 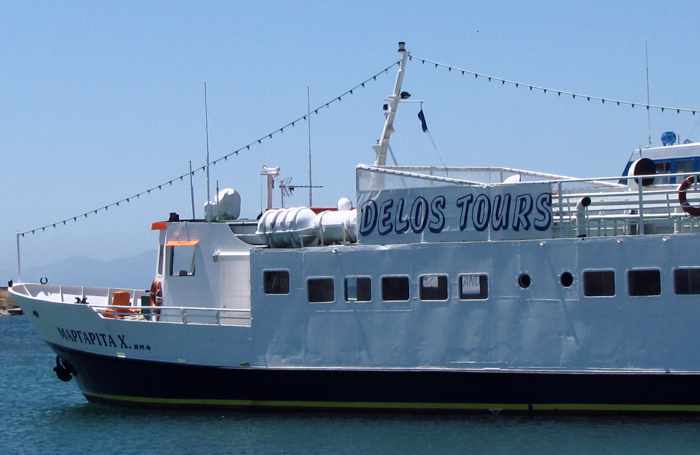 ♦ Delos Tours: The operator of the Delos ferries also arranges charters, by the day or by the hour, for private events and special occasion celebrations. Contact the firm for prices and booking information. 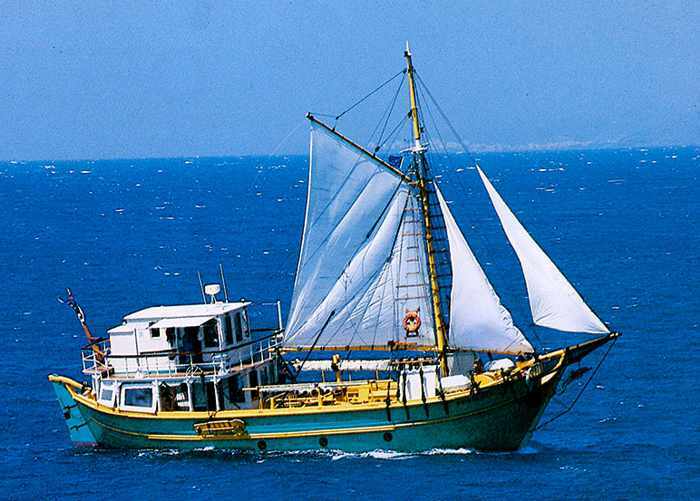 ♦ Mykonos Cruises: For nearly 50 years, the Association of Boatmen Platys Gialos has been operating a shuttle service between several of the most popular beaches on the southern coast of Mykonos, transporting passengers in traditional wooden boats. 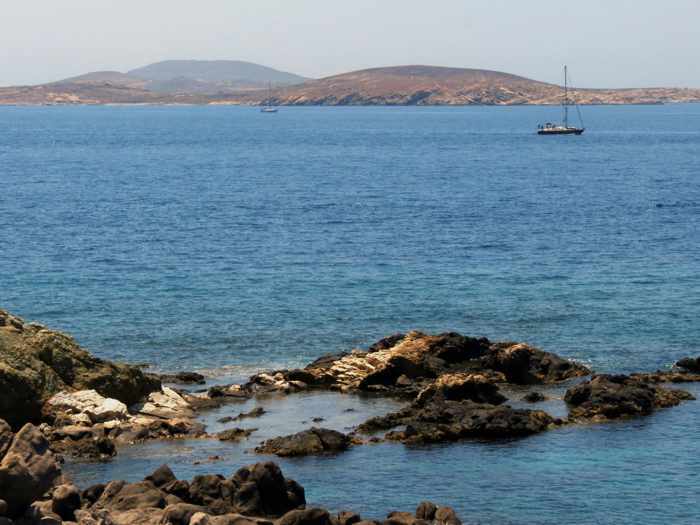 The Boatmen also offer full-day charter cruises to Delos from Platis Gialos beach and Ornos beach. The tours last a minimum of 4 to 6 hours, and the boats can accommodate up to 12 people. The Glaros, a larger caique that can carry up to 40 people, also is available. Prices start at €90 per hour, and private guided tours of Delos can be arranged. ♦ Private charter daytrips are available from another company that is, confusingly enough, also named Mykonos Cruises. Previously called Aegean Ventures, the firm changed its name when it reorganized its management structure in December 2015 and acquired a third ship for its private charter and excursion tour fleet. Several packages are available for private cruises to Delos — a Delos day cruise, a Delos & Rhineia cruise, and a Delos and Mykonos south beaches cruise. Each includes an open bar, snacks and food, and prices start at €1,000 for 3 hours on its Dolphins of Delos excursion boat. Rates are higher for the same cruise on the company’s other ships, the Quarantine of Delos and the Sofia Star. See the tour descriptions on the company website for charts showing hourly rates for all three ships, as well as details of the services provided. ♦ Mykonos on Board offers private and semi-private cruises to Delos on its two sailboats. Prices are not provided on the company’s website, so interested parties must contact Mykonos on Board to inquire about rates and availability. ♦ Mykonos Rib Cruising offers private custom charters, including full-day and half-day trips to Delos and Rhineia, on its 36-foot Scorpion Seafarer Super Rib Boat. Cruise hosts Claudia and Nicholas get rave reviews on social media and on TripAdvisor, where they had received 45 “excellent” ratings out of 45 reviews posted at the time I prepared this article in March. Rates for their 4-hour excursions start from €650 in low season (for 4 people; the boat has capacity for up to 4 more at €50 for each additional person) and can range from €880 to €1,280 in high season. Eight-hour cruises also are available. I have received excellent feedback about Mykonos Rib Cruising from readers of my blog. 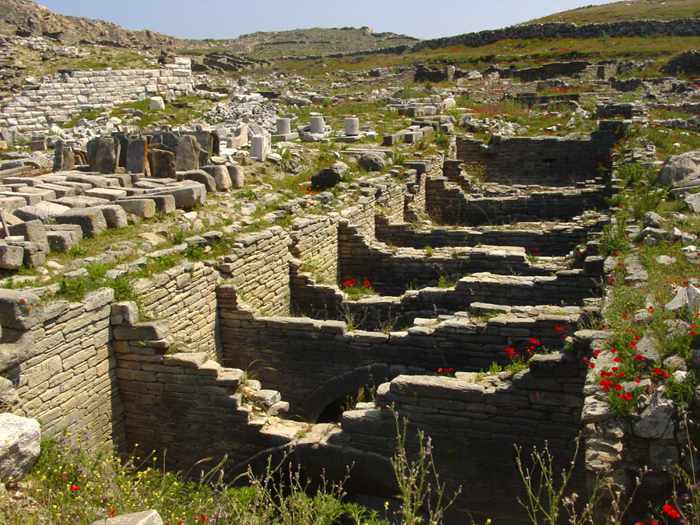 ♦ Mykonos Tours can arrange private 4-hour guided tours of Delos as well as combination Delos/Rhineia daytrips, but prices aren’t provided on the company website. ♦ L’o Yachting arranges private charters (with crew) for all types of vessels, including motor yachts, sailboats, rib boats and traditional wooden caiques. Its Crystal Charter sails around half of Rhineia and includes stops at two secluded beaches on that island; however, arrangements can be made with the captain to include a stop at Delos. ♦ Mykonos Sailing is another yacht charter firm that offers a 6-hour day cruise to Delos and Rhineia on a choice of vessels including motor yachts, sailing yachts, traditional wooden ships, and a 50-foot catamaran. ♦ Phoebus Mykonos Yacht Charter offers a Delos & Rhineia daytrip on the Phoebus, a former merchant ferry ship that was constructed in 1948 and full reconstructed into a cruise ship in 1998. Charter prices depend upon group size and start at €2,200 plus fuel consumption fees and taxes. Private charters to Delos can be arranged on the Phoebus, seen here in a photo from the Phoebus Mykonos Yacht Charter website. If you’re planning to spend all or part of your vacation on Naxos or Paros, you should be able to take a daytrip to Delos if you’re visiting between May and late September. 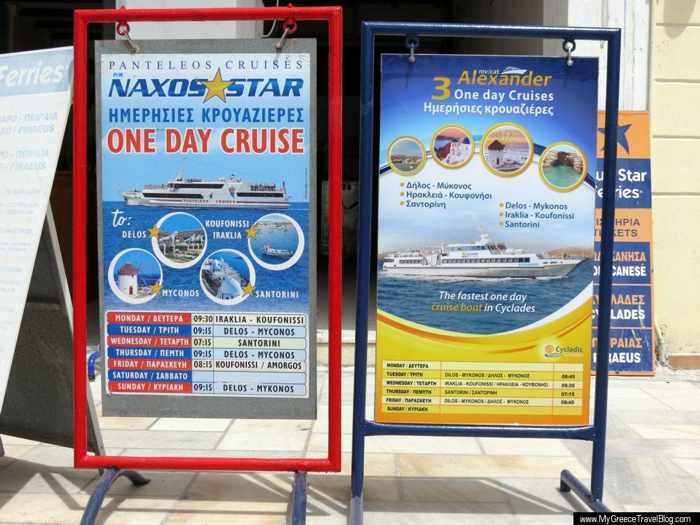 In past years, day cruises to Delos and Mykonos have been offered on the Panteleos Cruises ship Naxos Star on Tuesdays, Thursdays and Sundays, and most likely will be available again in 2016 on those same days. Similar day cruises have been available on Tuesdays and Fridays on the tour boat Alexander, and I expect they will be offered again this year. For ticket prices and to confirm sailing dates, check with travel agencies and ferry ticket offices on Naxos and Paros. 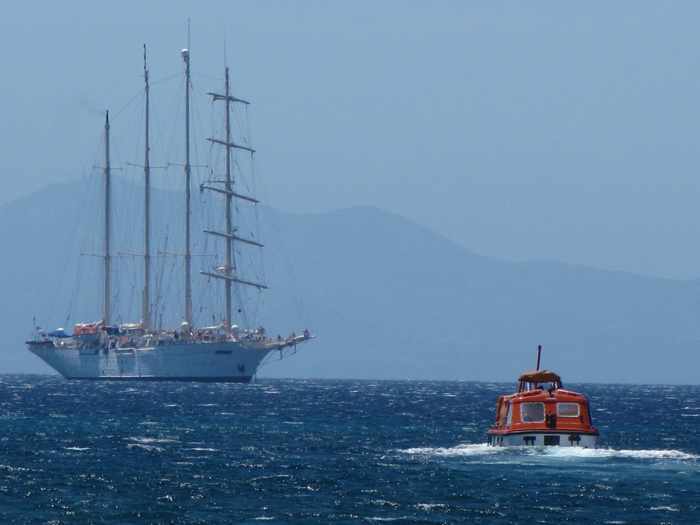 In years past, Captain George Fragiskos arranged daytrips from Naxos to Delos and Rhineia on his sailing yacht the Annabella; however, his Naxos Sailing website does not include a Delos itinerary for 2016. You can contact him through his website to inquire about possible charter tours to Delos. From Paros, another daytrip option is a sailing excursion with Captain Yiannis on the Agios Georgios, a traditional wooden caique. His Delos day tours cost €55 for adults and €30 for children if booked in advance online. The tours depart from Piso Livadi at 9:30 a.m. and return by 7 p.m. Captain Yannis provides beverages, snacks and a BBQ during the trips. To obtain further information or to book tours, you can telephone Captain Yannis at: +30 697 271 4951 or click here to send him a message through an online contact page on parosweb.com. Private charters also can be arranged. It’s possible that other day tours to Delos are available from both Naxos and Paros, so check with local travel offices on those islands to find out if any are being offered during the time you’re visiting. You don’t have to take a guided tour to explore Delos — you can wander through the ruins at your own leisure if you prefer. But unless you have a good Delos guidebook, you probably won’t have a clue what you are looking at, and you won’t understand the historical significance of the various monuments and sites. If you take a guided tour, you will be led to the island’s leading attractions, where knowledgeable guides describe what you’re seeing and explain their significance. The downside to guided tours is that the groups can be large — dozens of people, in fact — and it can be difficult to hear the guide. (Delos tends to be very windy, which makes it even more difficult to listen to the guides. I took a guided tour once, but couldn’t hear the narration most of the time, so I left the group early to wander around on my own.) Also, tour groups often converge on sites at the same time, literally causing traffic gridlock on the narrow footpaths. Don’t be surprised if you have to elbow your way past throngs of other tourists to see some of the ruins — or get your feet stomped as people push, shove and jostle for prime viewing and photo-taking spots. 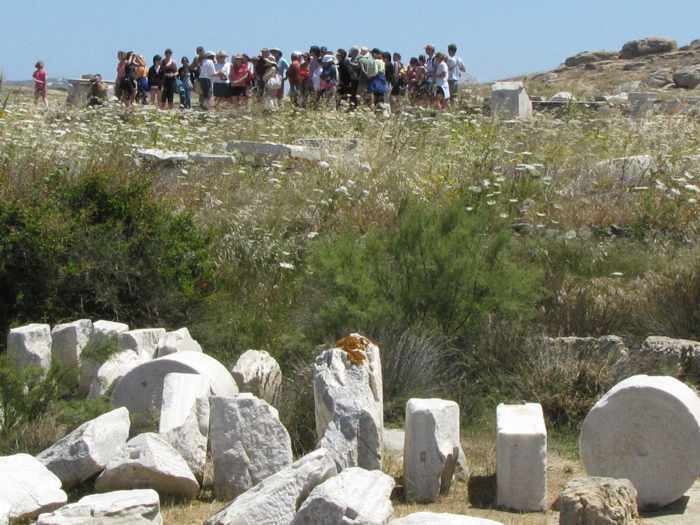 A tour group gathers at a site on Delos. Guided group tours often include up to 50 people, though private tours can be arranged for however many people are in your party. 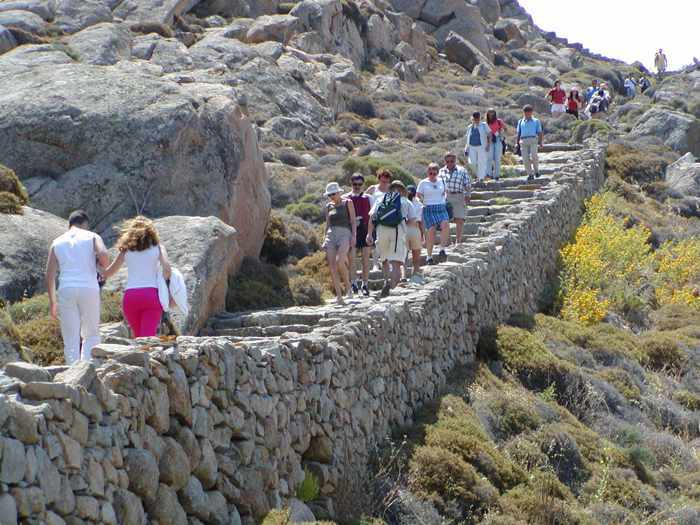 The most economical guided tours are offered by Delos Tours, and are available only from May until the end of October. These cost €50 for adults and €25 for children aged 6 to 12, and are free for kids under 6. The packages include the ferry rides to and from Delos, admission to the archaeological site, and a tour of the Delos ruins with a licensed guide. Tours with English-speaking guides are available at 10 a.m. and 5 p.m. every day. French-speaking guides are available Wednesdays and Saturdays at 10 a.m.; tours in German are offered Fridays at 10 a.m.; and Italian language tours are available Tuesdays at 10 a.m.. Arrangements can be made for tours with a Spanish-speaking guide. 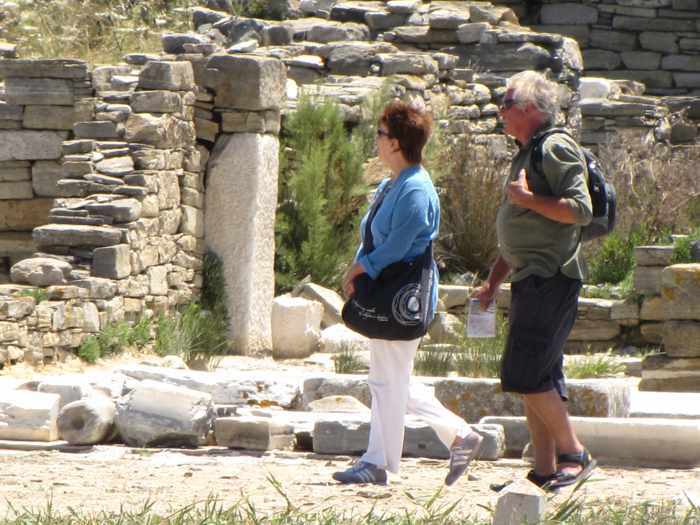 Some of the private charter trips to Delos include guided tours, while others do not. If you’re taking a charter excursion, check with the tour provider to confirm if a guide is being provided. ♦ Delos & Mykonos Guide: Mykonos resident Antonis Pothitos, who has been profiled by Guide Advisor, has been offering guided tours of Delos (and other islands in the Cyclades) for more than 10 years. One of his most popular tours is the Sunset Delos Experience. Antonis doesn’t list fees on his website, so interested parties must contact him directly for prices and booking. Photos and further information are available on his Delos & Mykonos Guide Facebook page. 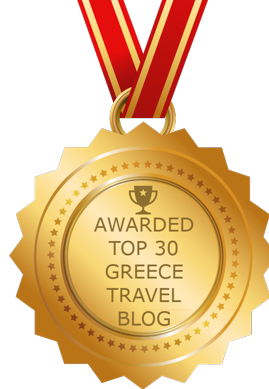 I have heard only positive comments about Antonis from people who have taken his tour. 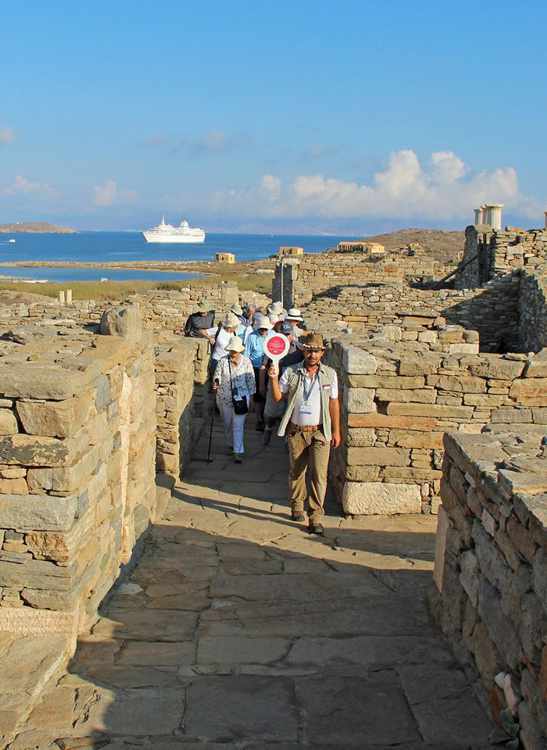 Guide Antonis Pothitos leads a tour through the Theater Quarter on Delos (Photo shared on Facebook by Lars Anger of Sweden). ♦ Archaeologous offers a 3-hour private guided tour with a licensed guide. This includes a 1.5-hour tour of the archaeological site, a half-hour museum visit, and one hour of free time for guests to explore the island on their own. Prices depend on the number of people in the group (maximum 50), and cover the fee for the licensed guide only. For one person, the cost is €188, and for 2 people it’s €94 per person. Sounds expensive, but if you have a large group, the per-person rate is much, much lower — €9 per person for a group of 20, for example, and €6 per person for a tour for 30 people. You can determine prices for your own group by using a sliderule calculator on the Delos tour description page of the Archaeologous website. Note that ferry tickets and Delos admission fees are not included in the price, and must be paid by tour participants. ♦ Delos Private Tours can arrange tours with licensed guides who speak English, French, German, Greek, Italian, Japanese, Portuguese and Spanish. One tour lasts approximately 1 hour and 45 minutes, and costs €230 for the guide’s fee. This price does not include the ferry fare or the entrance fee to the archaeological site, which customers must pay. A 3-hour tour costs €300 for the guide alone; customers must pay for their own ferry tickets and admission to Delos. If you’re not particularly interested in history and archaeology, or quickly get bored looking at ruins and museums, you might think a trip to Delos would be a waste of time. But think again. If you’re spending a few days or longer on Mykonos, one of the return ferry trips to Delos offers a great opportunity for a boat ride, fresh air, new scenery, and some hiking and walking exercise — and it will take less than half of a day. Consider packing a picnic lunch (or purchasing snacks, drinks and sandwiches from one of the many cafes in Mykonos Town) to enjoy with the impressive sea and island views from the summit of Mount Kynthos. A series of paths and stone steps lead to the top of the 110-meter mountain, where you’ll find the remains of a sanctuary for Zeus Hypsistos, which dates from the 7th Century BC. 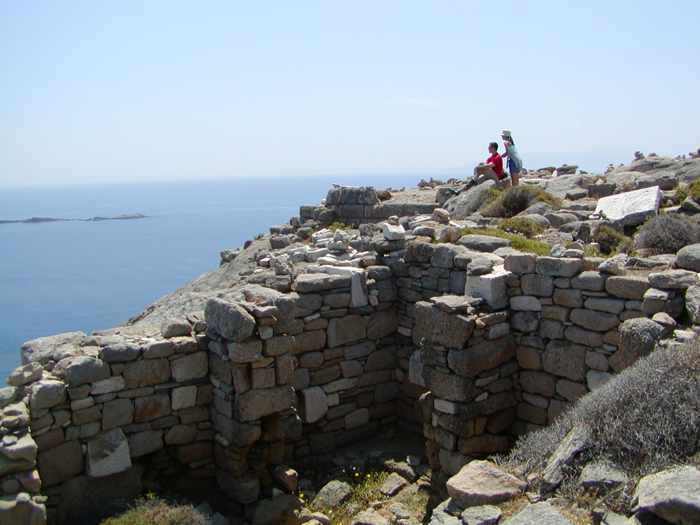 If it’s a clear day, you’ll have amazing views of Mykonos and other islands, as well as the Delos ruins below. Tourists climb stone steps to the summit of Mount Kynthos. The path is much, much steeper than it appears in the photos. ♦ An illustrated Delos e-book is an excellent source of information about Delos and a must-read if you’re planning to do a self-guided tour of the island rather than participate in a private or group guided tour. The 462-page e-book was written by P.J. Hadjidakis and is packed with photos of the Delos ruins and monuments, as well as images of exhibits in the Delos Archaeological Museum. ♦ The Sacred Destinations website includes a Delos page with photos, a brief history of the island, and a description of the major monuments and ruins to see on the island. ♦ There is little shade on Delos, so bring a hat that won’t blow off in the wind, and wear sunscreen. ♦ Bring bottled water or other beverages and snacks. Water can be purchased on the Delos ferries, but on Delos itself the only place to purchase food and drinks is at the expensive cafe near the museum. ♦ Take the 9 a.m ferry to avoid the crowds that show up for the 10 a.m. guided tours, and immediately head to the houses with the famous mosaics so you can view and photograph them without having your sightlines blocked by hordes of tour groups. ♦ Bring a good guidebook if you’re not planning to take a guided tour, or read the e-book I mentioned above. Many souvenir shops in Mykonos Town sell illustrated books about Delos.